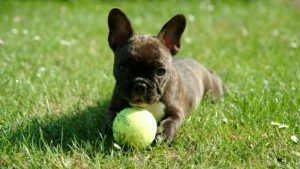 Figuring out what to buy for a new puppy can certainly be daunting. Just walking through a pet supply store, or checking what’s available online is enough to send anyone into a panic. Don’t worry, because this very comprehensive checklist will tell you everything you need to know. Having all the basics bought and set up before your pup comes home makes everything so much easier, but if you can’t you can’t! Dog bowls come in plastic, ceramic, silicone, stoneware and stainless steel. A quick note about plastic bowls – when they become scratched bacteria can lodge in the crevices; they can be easily destroyed if your pup decides to use them as a chew toy. I have two dogs. I use a stainless steel bowl for water for both of them, one eats from a stainless steel bowl, the other from a ceramic one. I recommend purchasing heavy bottomed stainless steel or ceramic bowls for food and water. They are easy to clean, hard to knock over and won’t become a chew toy. Please make sure clean fresh water is available at all times!! Nutrition is a topic that requires more than a few sentences of discussion, and since this post is about supplies I’m going to keep this brief! Dog food comes in several formulations – dry, canned, raw, homemade, dehydrated/freeze dried. It is available in your local dollar store, supermarket, pet supply store, vets office, online or from your very own kitchen. You can buy grain free, some with added supplements and prescription diets for specific conditions and issues. A quick tip – as with the ingredient label on human foods, dog food ingredients are listed in order of content. I recommend you choose a good quality puppy food with ingredients you can identify. Note – When your puppy first comes home you should feed him the same food he was eating at the shelter, foster home or breeders, then gradually switch him over to your new brand…unless you’ll keep him on the same diet! Add a very small amount of new to the old, adding more until he’s completed changed over. The process should take about a week. Puppies love treats and it’s a good thing because it makes training them much easier!! The problem is it’s easy to overdo it, so be mindful not to use them as a meal, every time you walk by him, or because he’s so darn cute!! As with food, treats can be bought almost anywhere, and of course the quality will differ. 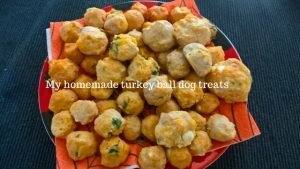 If you’re concerned about what goes into them, you’ll be happy to know there are literally thousands of recipes online, many of them super easy to make. If you prefer the convenience of buying them, again, look for ingredients you can identify. I like the idea of a spoon specifically set aside for use with dog food. So whether that’s an extra one you have lying around the house, a cheap one you buy in the dollar store, or one made specifically for pet food, the choice is varied…and yours!! If you’ll be using canned food you want to keep it fresh. You can put it in a zip lock bag, cover the top with foil or buy lids made for just that purpose. If you’ll be feeding dry food you may want to think about buying a food storage container. Whichever container you buy – a big plastic storage box or one specifically made for dog food, make sure your very enterprising and determined pup can’t pry the lid off. Even if it’s impenetrable I recommend keeping it out of reach to avoid temptation!! Collars come in various sizes, widths, materials and designs, and some have matching leashes and harnesses if you really want to get fashionable!! Keep things simple by starting off with a nylon collar with a buckle and be sure it fits well. Too loose and your dog will easily slip out of it, and too tight is a danger. The trick to knowing if it fits is if you can fit two fingers between the collar and your dog’s neck. Keep an eye on the fit as he grows and replace it when needed. Some even have the option of the name and phone number embroidered directly onto them, so no ID tag is needed. Your dog absolutely must be micro chipped whether it’s a law in your area or not. If the unthinkable happens and he gets out, you need to have done whatever you can to increase the chances of him coming home. Also, if you will be travelling to other countries with your pup, some are very strict and require it as proof of identification. The size of a grain of rice, it is inserted between your dog’s shoulder blades. Each one has its’ own identification number that corresponds to your contact details. Should your dog ever be lost, a handheld scanner reads the ID number which, when looked up, reveals contact information. It is very important to always keep your details up to date. An ID tag is a medallion that hangs from your dog’s collar and contains your contact information. Some people put their dog’s name, address and phone number on it, some put their name and number (not the dog’s name) while others only put phone numbers. Yes you should have both!! I like a 4’ or 5’ nylon leash for training and comfort. As popular as they are, I do not recommend a flexi leash as they offer no control so are no good for training or when out in crowds. You could carry bags in your pocket, tons of people do! I prefer a holder and I have one attached to every leash so I’m never without bags…unless of course I forget to refill them!! Even your poop bags can be stylish with lots of colours and styles to choose from and yes, I admit, we often buy them. FYI – there is a difference in quality and the last thing you want is a bag breaking at the worst moment. Been there, done that! When walking after dark you want to be as visible as possible to other walkers and cars. High viz vests (for your dog!! 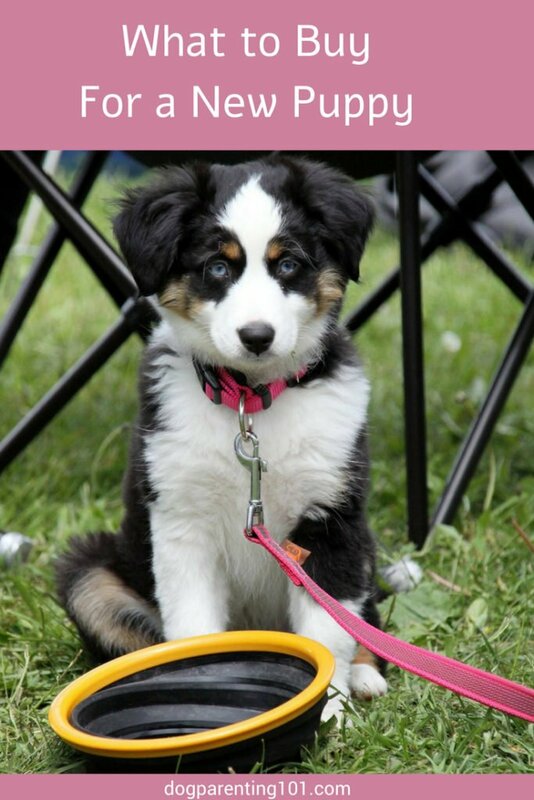 ), light up collars, flashing discs and reflective or light up leashes are all wonderful safety options. I little flashlight will help you find the poop on your night time walks. 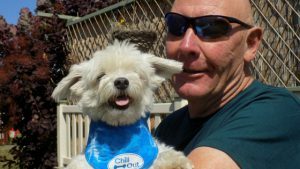 If your dog has a hard time in the heat like mine does, a dog cooling mat, bandana or vest will definitely help them cool down. If you live in a cold and/or rainy climate then protective clothing is a good thing to have on hand…and not just for the tiny dogs! Big dogs may need the extra warmth and protection as well! Salt and snow can be really tough on a dog’s paws…not to mention painful. Booties are a great option, except many dogs are not willing to wear them. Having said that, starting them off when they’re young means a greater chance of cooperation. If it’s not going to happen, paw wax will do the trick. Flat, high sides, round, square, rectangle, orthopedic and more, beds come in so many styles, sizes and fabrics how do you even begin? Finding the bed your pup will love can be a case of trial and error, but it’s always a good idea to start with one that has a tougher fabric, resistant to chewing. Once he’s had some training and stopped chewing everything in sight, you may not have to worry too much about material, other than comfort. If you have dogs then you need blankets. Whether it’s to throw on top of his beds for extra warmth and comfort, to protect your couch when you’re relaxing together, or to make his crate or carrier cosier, you’ll always have a need for them. A crate is such a great housetraining tool, but it’s also more than that. Crates are available in different sizes, styles and price points you’ll easily find something to suit your needs. 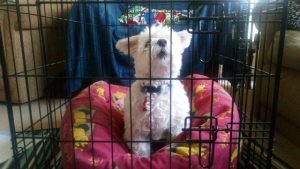 My advice – the crate should be big enough for your pup to stand up, turn around and lie down comfortably, but not too big that he has enough room to pee or poop in a corner. Your pup will need a pillow or pad to lie on, and again chew proof is best to start off with. Every puppy needs to be trained, but how you decide to do that is up to you. You could attend organised puppy classes, have a trainer come to your home for one on one sessions or “virtually” or do it yourself. If you decide to train using the clicker method, you will need the device! Slide the pouch onto your belt or clip it on a pocket, waist band or purse to keep treats close at hand and easily accessible. Why is that necessary? When you’re training it’s important to reward your dog immediately, so he will understand the connection between the reward and the behaviour. For those times when you are unable to keep an eye on your puppy, an exercise pen or baby gates are the perfect solution. A pen is made up of wire panels that fold, and keeps your pup in a specific area. You can extend it fully, or not, depending on the size of your space. You can even attach a couple together for an even bigger play area. Baby gates are pretty much a “must have” item. Block off doorways to rooms you don’t want your pup having access to, and put them at the top and bottom of the stairs for safety. The range of toys available is mind boggling!! Having said that it’s a good thing, because you can find a toy for so many different purposes. Chew toys satisfy the need to gnaw so he won’t use your favourite pair of shoes! Don’t give your pup too many toys to play with at once, it will overwhelm him. One or two, then rotate to keep him interested. Available almost anywhere quality varies, so only buy strong, durable and well- made toys, with no small parts that can be chewed off and swallowed. Just like we brush every day to keep our teeth and gums healthy, we should be doing the same for our dogs. Poor oral hygiene can cause pain we don’t even know they’re feeling, as well as serious health issues down the road. Fortunately there are lots of products that can help. One note of caution – be sure Xylitol is not an ingredient in anything your dog ingests as it is dangerous! A doggy toothbrush looks like a human toothbrush, and for convenience some come with a small brush on one end, a larger one at the other. Other styles include ones that fit over your finger, silicone and electric. Gels or pastes, wipes or sprays, toothpaste comes in various flavours some more natural than others. Like a mouthwash, it is added to your dog’s drinking water to help clean teeth, freshen breath and keep plaque at bay. Giving your pup something to chew on can help keep teeth clean, and of course keep him occupied and entertained. Have a conversation with your vet about the options you have. What you choose will depend on whether or not having natural ingredients are important, and if you prefer homemade when possible. I use the Seresto collar for my dog Jack, because I couldn’t find anything else that protected him against fleas. Your vet will advise you if and when supplements such as fish oil for example, may be recommended. This is a detailed list of everything one could need to groom a dog. Even if you decide to have a groomer take care of everything, there are still a few things you’re going to need and this will, help you decide what that will be. You can never have enough towels on hand when you have a dog, I always keep one near the door on a rainy day. Hard bristles or soft, wide tooth or not, a daily brush keeps your dog’s coat clean and untangled, feels good (for your dog!) and is a wonderful bonding opportunity. Brushes will get rid of loose hair, but nothing like a de-shedding tool…at least not in my experience. You don’t want to scare your dog so he develops a lifelong fear of blow dryers, so if you will be using one put it on the lowest setting and don’t blow it in his face. Sorry if this is obvious!! Ear cleaning is important to reduce the chance of infection and prevent wax build up. It’s best to ask your vet’s advice about frequency and have him show you how to do it safely. 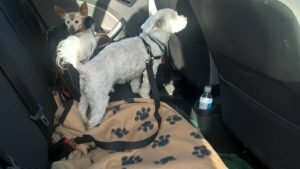 Some pup parents have an easy time trimming nails, some don’t, and others don’t want to do it at all (like me!). Your vet, vet nurse or groomer can show you how if you want to give it a try. If you’ll be using nail clippers you’re going to need styptic powder. There is something called the “quick” inside your dog’s nails, which is basically a tiny blood vessel. It is often clipped when an inexperienced pup parent cuts their pets’ nails. This powder is a clotting agent and antiseptic that pretty much stops the bleeding immediately. If you’ll be grooming your dog on your own, scissors or clippers are a necessity. 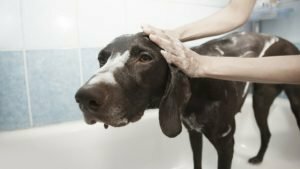 Even if you will be completely relying on a groomer to keep your dog clean and beautified, there will be times when you’ll need to give your dog a bath. Rolling in mud or something unidentifiable is a very common reason!! What I’m about to say applies to all caregivers, so it’s easier if I say it once. Some are great, some should have their licenses revoked. Sorry but it’s true. I don’t say this to scare you, I say this because I don’t want you to think that every vet, groomer, trainer or pet sitter is amazing…because they aren’t! Having said that, with a bit of research you can find the incredible souls who will help you take great care of your puppy. 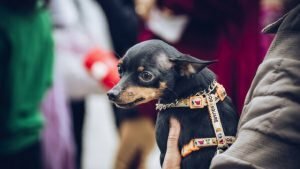 I wrote an article a few months ago called “How to Find a Great Vet.” It is published on this sister site Caring For a Senior Dog, but the tips are relevant no matter what age your dog is. The best way to find a groomer is by asking dog parents who they use. Other options include checking with the vet staff or doing a search for groomers in your area. However you find the names for your list I recommend calling and having a chat about the process, how long it takes, how much it costs and if you meet in person it’s a chance to check out the cleanliness of the facilities. Have a conversation with any trainer you’re thinking of hiring and ask questions. What methods do they use? Is it positive, rewards based training? Never ever use someone who punishes, and never believe them if they try and convince you it’s the best way to train. If you’ll be going to puppy classes, ask to observe one to see what it’s all about. If you’ve decided on private lessons in your home, ask to meet the trainer before you commit. Most will be happy to come and have a chat in person, but clarify in advance whether you will have to pay for that! It can be stressful leaving your new puppy alone for the first time, even if you’re only gone a few minutes. A nanny cam is a great way to see what he’s up to, to reassure yourself he’s fine or help you spot an issue before it becomes a full blown problem. For example, is he in his crate barking the entire time you’re out? Is he running from room to room looking for you? Both of these could signal separation anxiety which is a problem that won’t go away on its own. The sooner you spot it the sooner you can help your pup deal with it. If you’re missing your dog and/or you just want to show him off to anyone that will listen, what better way than a live feed! Train companies and airlines have specific requirements so call before you buy. In some places it is a law for your pup to be secured in a vehicle, but it makes good safety sense so you should do it anyway. A seat belt has the buckle that snaps into that piece in the car (don’t know what it’s called!! ), and the other end has a clasp to hook onto your dog’s collar or harness. Another way to secure your dog so he can’t move around the car, but can still look out the window. Whether you’re out on a day trip or extended holiday, collapsible/foldable food and water bowls are easy to transport, don’t take up much space and some even fit in your pocket for easy access!! Protect your car seats from muddy wet paws and dog hair with a car seat cover. Towels, blankets and sheets can help to a certain extent but they are not waterproof and easily move, so they aren’t ideal. One specifically made for that purpose will offer the best degree of protection. A dog barrier will keep your dog securely in the back of the car, preventing him from running around and causing an accident. Be prepared in case of trouble on a car trip with a well-stocked emergency kit. Buy a ready made one and add to it (if necessary) or put together your own. Keep drugs, cleaning products, wires, rubber bands, plants, small toys and any other potential hazards out of your puppy’s reach. 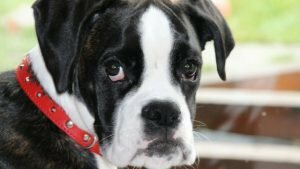 Should you have a concern about something your puppy might have ingested don’t wait until you see symptoms, call the poison control hotline immediately. Program the number into your phone, keep it by your landline and anywhere else for easy access. Be prepared to rush him to the vet if necessary. Why do things seem to happen after the vet closes for the day? Having the address and phone number of 24 hour emergency hospitals in your area is a must. Keep the details in your phone and in an easily accessible place in your home. Keep one wherever you’re going to be with your dog – home, car, motorhome, cottage… Readymade kits are available for purchase or check out the items they include and make your own!! I go through paper towels like crazy!! I don’t blame you for looking for the cheapest ones around, but often they end up costing the most because you need so many more to do the job. Accidents happen and muddy paws happen so a good carpet cleaner is a must. You may need to try a few before you find the one that works best for you. There are lots of natural options on the market that are safer for your pets, or fine homemade recipes online. With people, kids and now a dog running around, carpet freshener is a great product to have on hand to “freshen” things up. Sometimes a carpet cleaner isn’t enough, or every once in a while you want to give your carpet a really deep clean. A steam cleaner is the way to go. I have one and it makes a huge difference to the state of my carpet. I know it’s not technically a cleaning product, but sometimes you’ll have a dog that is resistant to some flea treatments. If that happens and you find yourself with a flea situation, you’ll need it. Wow, what a list!! Don’t worry you certainly don’t need everything at once, and some things you may not ever need or want to buy. 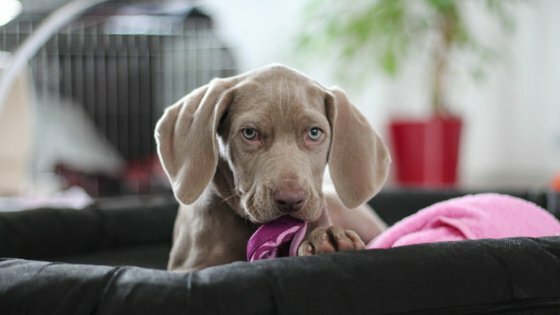 I know having a new puppy can be overwhelming, especially if it’s your first dog, so it was important for me to create as comprehensive a list as I possibly could for you to use as a reference.